Surprise your special ones by sending these Blossoming Peace of Love Red Dutch Roses in a Vase and spread love and happiness around. 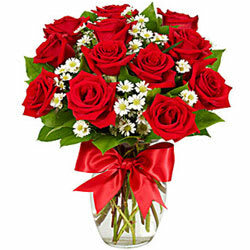 These 12 Red Roses Bouquet are decorated with Fillers Flowers and presented in a Vase. Surprise your loved ones with this Enchanted Seasons Greetings 18 Dutch Red Roses in a Vase and stay forever in their hearts. This Red Roses Bouquet is arranged with Fillers Flowers and arrive in a Vase. Surprise your loved ones with this Enchanted Seasons Greetings 24 Dutch Red Roses in a Vase and stay forever in their hearts. This Red Roses Bouquet is arranged with Fillers Flowers and arrive in a Vase.